Gardening takes on a whole new attraction when you add height to the features you orchestrate outdoors using pots and hanging baskets. My wife and I have been growing annuals and perennials in outdoor containers since 1987, and here’s a quick look at what works for us. All of these containers fit into one of two broad categories: those that require frost-free winter storage and those that do not. Traditional, fired clay pots and ceramic containers look gorgeous (we love them), but break under the pressure of soil that expands as it freezes in Canadian winters. That’s why clay needs to be stored over winter in a place that doesn’t drop below 0ºC. A basement or heated garage works well. So does a root cellar. Do you have a place like this? If you don’t have a convenient location to store planters so they don’t freeze over winter, don’t worry, you’ve still got good options. There’s a growing array of winter-tough outdoor pots available, and these are for more than just lazy, space-strapped gardeners. The best also offer the option of using very large gardening containers that couldn’t practically be moved indoors even if you had the space. The largest we have measure about 32 inches tall and are made of resilient plastic that expands with frozen soil during winter. Some designs are light brown and smooth (reminiscent of fine clay), while others are rougher and look enough like coarse clay that you need to touch them to see that they’re actually made of structural foam. Reinforced concrete offers another type of winter-hardy plant container. The best look like stone, but are tougher. Synthetic strands worked into the casting yields a very strong structure that won’t crack. Simply add soil and plants, then leave outdoors. In more than 15 years of using reinforced concrete planters, we have yet to find a single crack, even with pots that go into the winter filled with waterlogged soil. Coir-lined hanging wire baskets and window boxes offer an under-appreciated container gardening option that offers unique advantages. Coir is the name for fibres extracted from just underneath the outer shell of a coconut, and it’s used for ropes, mats, sacks, erosion control on river banks and inside wire-framed plant containers. Coir fibres are woven or molded into shapes that sit within specific metal frames. Each coir liner is replaceable, and last several years with care. They provide a much prettier alternative to those ordinary plastic hanging baskets, and they provide exceptional drainage. Although root growth and annual soil removal tends to reduce the thickness of coir liners, you can put thin, partially used liners into new, thick ones before adding soil. This gets the most life out of each liner. We get two to five years of use from each one. Not all plant pots come from the store with drainage holes in the bottom, but all definitely need them. 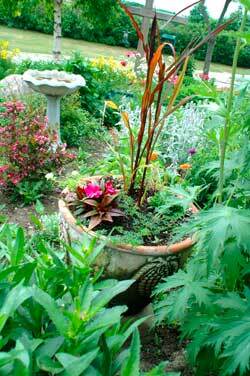 Without the ability to drain, water will saturate the soil in the bottom of a pot and drown roots. 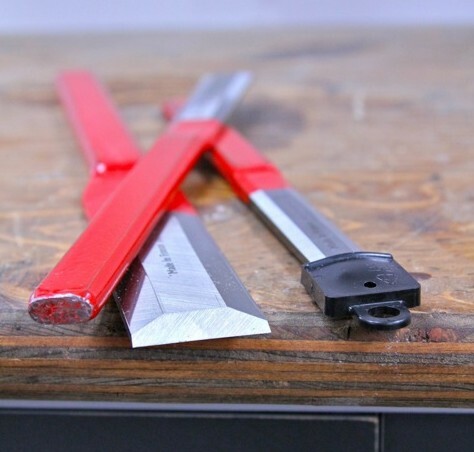 Use a 1/2” diameter spade bit in a drill to bore holes in plastic and structural foam pots. A carbide drill made for glass works well for ceramics and a masonry bit is best for reinforced concrete containers. You’ll get best drainage action of you fill the bottom few inches of the pot with crushed stone or pebbles before adding soil. 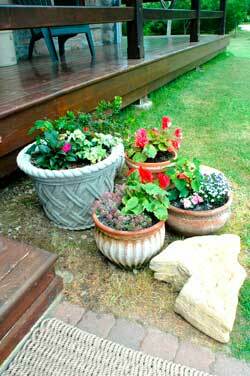 Outdoor gardens look so much nicer with pots, planters and hanging baskets that we’d never garden any other way. 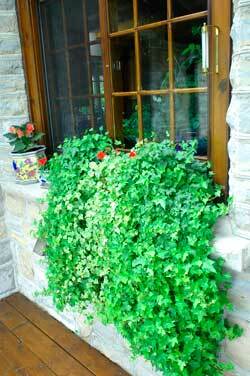 Try a bit of container gardening yourself this year and see what I mean.